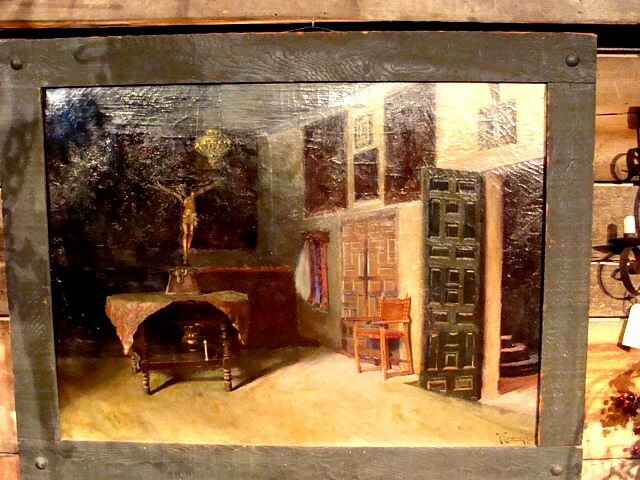 Here is an original Oil Painting from the Archives of the San Juan Capistrano Mission. Approx 4'ft X 5'ft Orig. Frame. This magnificent painting was painted by California listed Artist Francisco Conejo in 1891 "Sacristia de Convento de Churubusco" Signed and dated. Here is an original Oil Painting from the Archives of the San Juan Capistrano Mission. Approx 4'ft X 5'ft Orig. Frame. This magnificent painting was painted by California listed Artist Francisco Conejo in 1891 "Sacristia de Convento de Churubusco" Signed and dated. Please email cowboycabin@centurytel.net with questions or call 406 270-2842.